When I have the time, I always take some time to google up articles, columns and other such findings related to topics that interest me...including MRA topics, of course. It's always a pleasure to find writings I've never before had the opportunity to peruse, but upon finding them, find myself nodding in agreement. And today, I'd like to talk about one such find: the townhall column archives of Philis Schlafly. 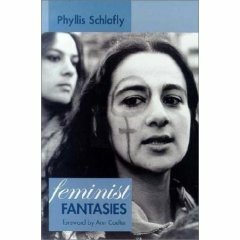 Mrs. Schlafly was the original Counter-Feminist...and I say that not to cast aspersions or to slight Fidelbogen and the title of his most excellent blog, Counter-Feminist, at all - but to merely point out that at a time when the feminists made tremendous headway into the consciousness of mainstream American, Philis Sclafly was one woman who stood up, and fought against the tide of popular political propaganda put forth by the feminists, and successfully lobbied and fought to stop the feminist's attempts to legislate feminist philosophy into law, the Equal Rights Amendment. When Schlafly took up her battle against the ERA, the Senate had passed it by 84 to 8. The House had passed it by 354 to 23. The ERA was written in to both the Republican and Democratic Party platforms. Thirty states had approved it in the first year after it was sent to the states for ratification. Only eight more states were needed. But the ERA had not yet faced Phyllis Schlafly. Over the next eight years, thanks to Schlafly and her Eagle Forum, only five states ratified it -- but five other states rescinded their earlier ratifications. The fact that she is a major player in defeating the radical feminists should make her an eternal hero to the MRA movement. Schlafly made a huge impact in decades ago, but she is by no means finished in her work in exposing the lies, deceit and family-destroying legislation and propaganda the feminists constantly attempt to foist upon society. The following are some excerpts from a few of her columns...points that make so much common sense, it's easy to see why this woman has been such an effective Counter-Feminist throughout her career as a Pro-Family advocate. It would seem that maintaining the father's love and authority would be crucial when a child's life is turned upside down by divorce. Yet, family courts routinely deprive children of one parent, usually the father, restricting his time with his child to about six days a month. The courts pompously assert they are invoking "the best interest of the child," but how can it be in the best interest of children to make them forfeit one parent? The International Violence Against Women Act is based on the lie that violence against women is the same problem in all countries. Many non-Western countries have social norms that justify abuse (such as genital mutilation, forced marriage, and polygamy), and "international standards" would vastly diminish the rights and benefits U.S. women now enjoy. Schlafly on exposing Hillary Clinton's Presidential Campaign's "Mom Strategy"
Clinton invites us to "imagine a country in which nearly all children between the ages of 3 and 5 attend preschool in sparkling classrooms." That children's paradise is France, which "makes caring for children a top priority," and where "more than 90 percent of French children between ages 3and 5 attend free or inexpensive preschools." The assumption of "It Takes a Village" is that daycare, run by tax-salaried and licensed "professionals" in centers regulated by the government, is preferable to mother care. Clinton even praises the fact that many French children are in full-day programs "even before they reach the age of 3." The re-issue of Hillary's old book dispels the notion that she is re-inventing herself as a moderate. Her mom strategy is badly out of sync with her book praising a country that starts government daycare for children at age 2. Schlafly on United Nations Convention on the Elimination of All Forms of Discrimination Against Women. The notion is downright ridiculous that American women (the most fortunate class of people who ever lived) should submit to a treaty that dictates uniform rules for 185 other nations, all of which treat women worse than the United States. It's good to see Mrs. Schlafly is still going strong, writing a lot of columns in the past year. The fact that she is largely unrecognized for her efforts speaks volumes to how much popular culture and the mainstream media will only idolize women who toe the politically correct, feminist line. That Phyllis Schlafly is the mortal enemy of a movement that claims to promote women tells you all you need to know about the feminists. Man, you gotta love Phyllis Schlafly! She was the original thorn in the side of feminazis everywhere. If it weren't for her, I don't want to contemplate where we'd be; we'd be a lot WORSE off, I can say that much. She was SELDOM acknowledged in the MSM when I was growing up; if she were mentioned, it was always in an unflattering way. When I finally got to hear her on a regular basis, I could see WHY; she's as politically incorrect as they come! Even now, we don't hear much about her on the MSM. I've written Glenn Sacks to tell him that he should DEFINITELY include Phyllis Schlafly amongst women who he lists as being on our side. I don't know if he ever put her name up, but he should. She's was preaching the the anti-feminist message DECADES before it was fashionable to do so; she's one of the originals, and as such, should be included. "but five other states rescinded their earlier ratifications". Which states rescinded their earlier ratifications?